This problem shows up using Firefox 33.1.1 on Windows XP (Service Pack 3). On the home page, click "Scores" on the grey bar. Use the "Calendar" to select November 26 to bring up the games from that date. With the page loaded, look for Toronto Raptors (TOR) vs. Atlanta Hawks (ATL). Click on the "Play-By-Play" link of that game. 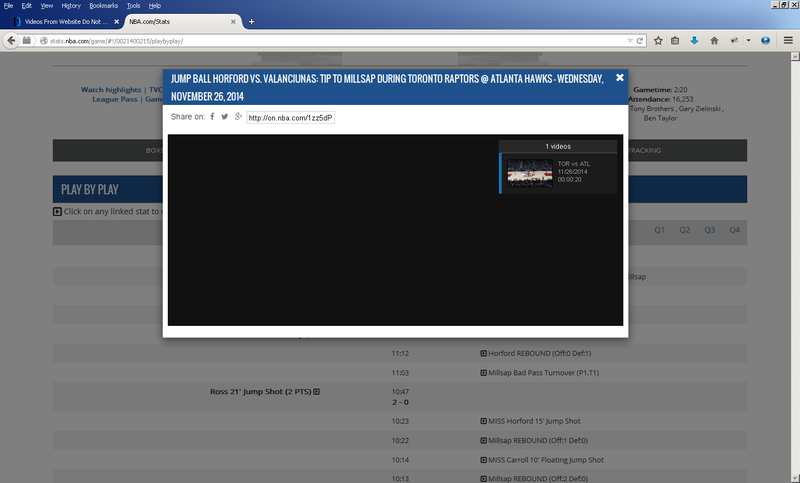 On the play-by-play page, click any event to bring up a "Video" pop-up. Click on "Video." I know for a fact that AdBlocker and NoScript — both used to improve web browsing — are not at fault, since I’ve removed both of them to be extra sure. The image I included was taken with both add-ons uninstalled prior to this post. The only way I can view any video from NBA Stats is to use a different web browser. Internet Explorer is discontinued due to security issues, and Apple Safari for Windows is no longer available. I can no longer use Google Chrome because it actually crashed my computer every time it accessed my audio driver, and Chrome by itself is another story entirely. Why can’t I view videos on NBA Stats through Firefox? If I went to another website like YouTube, I can view them just fine. It’s only that website where I’m having problems. When you visit a website, the address shown in the browser address bar is usually where most of the website is located. For example, if you visit a fictional website www. [hotel].com, most of the website is located at www.[hotel].com. Sometimes, websites combine content from different sources. For example, www. [hotel].com might display a reservations form in Flash that actually comes from [reservations.hotel].com. The content from the latter website is called third-party content. Third-party content might try to store information on your computer. In the hotel reservations example, you might be willing to let [reservations.hotel].com store information on your computer, such as data about which hotels you prefer, so that you can make a hotel reservation. However, you might not be willing to let third-party content store information on your computer in other situations. For example, a car-rental company, www. [my-car-rental].com, might have a banner ad on www. [hotel].com, to track your website usage or to record your preferences. To prohibit all third parties from storing information on your computer, deselect Allow Third-Party Content To Store Data On Your Computer. 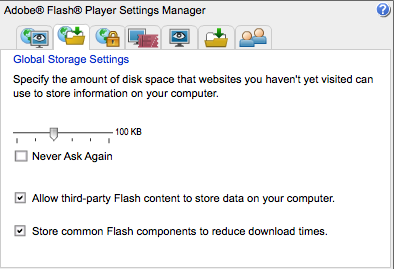 This option is available only with Flash Player 8 and later. Adobe recommends that you upgrade to the most recent version of Flash Player available. Just check off that box next to, “Allow third-party Flash content to store data on your computer.” And see what happens. Not the answer you're looking for? Browse other questions tagged firefox video troubleshooting flash debug or ask your own question. Why do these videos not work with Firefox anymore? How do I make h.264 work on YouTube on Firefox on Windows 7 64 bit? How can I disable HTML5 content in popular browsers like Firefox and Chrome?